XL Deploy and Microsoft development process improvement tools are long date friends. XL Deploy started supporting TFS since the 2010 version. Initially, the integration came in form of custom build activities for XAML templates. With TFS 2015, Microsoft introduced a simpler task and script-driven cross-platform build system and XL Deploy followed up with an extension that delivered the custom tasks that will integrate operations in between our build/releases and XL Deploy. The newly introduced extension was named ‘VSTS extension for XL Deploy’ which was published to the VSTS Marketplace so that all the customers can easily integrate it on their systems. You can find more information on the argument on XebiaLabs blog, for example V7.0 Plugin Adds Fine-Grained Control to Microsoft TFS/VSTS Deployments. Today XebiaLabs released a new version of the above-mentioned extension. The version number is 8.5 and it brings a lot of interesting improvements. First of all, the name. The extension is renamed to follow up on Microsoft new naming. 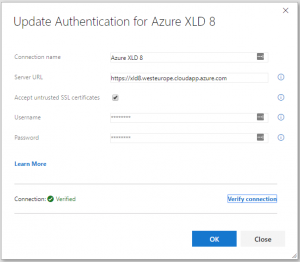 The name is “Azure DevOps extension for XL Deploy”. One of the major changes is laying under the hood. Tasks delivered by the extension are no more implemented with PowerShell, instead, they are based on NodeJs. This allows us to run all of them also on cross-platform agents. This, however, will require the agent version 2.117.0 or newer. There is an improved endpoint definition. You can now test your connection directly from the endpoint definition window. Also, there is better and more precise handling of the self-signed certificate that you can now ignore by selecting “Accept untrusted SSL certificates” flag on the endpoint service. Also, “Deploy with XL Deploy” task was simplified by letting you specify an advanced search pattern that will look for your deployment archive. How will this impact the customers using it? If you are already using ‘VSTS extension for XL Deploy’ extension, you can upgrade it with “Azure DevOps extension for XL Deploy”. Once the upgrade is done, your builds/releases will still continue using the old version of the tasks, until you do not modify them and manually upgrade to the new, version 7, of the task. In case you encounter any issues with the new version, you can always rollback the task to the previous version. This is a typical path of the major version update for tasks in Azure DevOps Services, same as many of the out-of-the-box tasks have shown us. You can find the nex extension here Azure DevOps extension for XL Deploy on Visual Studio Marketplace.